Building a business and maintaining a growing family at the same time might sound scary, but it can also help you prioritize the things that truly matter. Is having less time an opportunity to set boundaries for your clients? What happens when you have can’t do everything and have to choose? How can having a family teach you what’s actually your time worth? 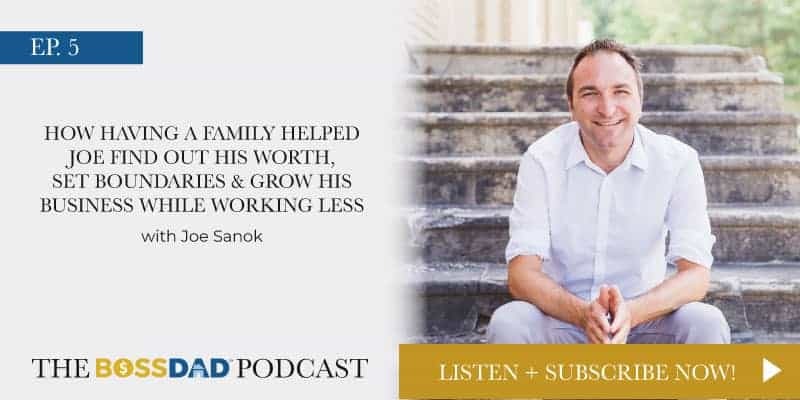 On this episode, Joe Sanok shares how his family helped him find his purpose. Setting boundaries around what’s best for my family was fine for my business, and I actually felt more alive because I was just working the nights I wanted to. Having a new member in your family can teach you how to make room for family time. Suddenly, it’s easier to say no to your clients and set boundaries when you know there’s someone at home who you need to spend more time with. Having a family teaches you what your time is worth because it will be a limited resource for your business. If you have a long waiting list, raise your rates. This way, you will make more money while working less. The liberty of making decisions, having to deal with the consequences, and making mistakes is the best way to teach your children about entrepreneurship. Building a business is all about making decisions, stepping out of line, taking risks, and seeing the effects of our actions. In business, focusing on the right strategies and tactics can determine how fast we grow and how happy we are with our life. We only have so much time to implement and try new things. When we force ourselves to do more in a smaller period of time, we prioritize as a necessity. As a result, we’re more likely to focus on the things that we know will bring revenue. Joe Sanok is a mental wellness counselor with over 7 years of experience, an entrepreneur, and a father. He helps small private practice businesses grow and scale, even when on a budget. If you want to find out more, check out his video on how to start a private practice business with only $200. If you’ve got a question about today’s episode or want to leave us some inbox love, you can email us at dana@boss-mom-sg.local.